The Hotel Hilton Chicago is found at 720 S. Michigan Avenue. That puts it in the heart of downtown Chicago and within easy reach of Grant Park, Lake Michigan, and so many other renowned attractions. It isn’t all about location, however. The Hilton Chicago also offers a colorful history, ample facilities, and some of the most enticing guest units in town. In relation to history, numerous presidents have visited over the years, and it was just outside the sprawling hotel that rioting took place during the 1968 Democratic Convention. As for the Hilton Chicago facilities, highlights include an indoor pool, fitness center, indoor running track, and no less than 234,000 square feet of meeting space. One of the largest Chicago hotels, the downtown Hilton offers more than 1,500 rooms and suites. Some of these units feature a more elegant and classy decor, while others are more modern in design. The rooms and suites also vary in size, the largest offering two beds and two baths. Common amenities across the board include flat screen TVs, in-room computers with internet access, signature Hilton Serenity beds, workstations, dataports, two-line phones with voicemail, coffee makers, hair dryers, and irons. It should be noted that many of the rooms at the Hotel Hilton Chicago offer wonderful views. Book a "Lakeview" unit, for example, and you’ll overlook such landmarks as Lake Michigan, Grant Park, the Museum Campus, and Soldier Field. All rooms at the Hilton Chicago are non-smoking. Room service is available morning, noon, and night. Self-parking is available at the Hotel Hilton Chicago, as is valet parking. Fees apply for both. It is $45 for 12-24 hours of self-parking and $57 for 6-24 hours of valet parking. In and out privileges are extended, but thanks to the hotel’s wonderful location, you might not need to use them. 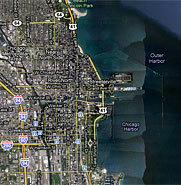 So much is within walking distance of the hotel, and Chicago is known for its excellent metro system. Taxis are also readily available, and it is always possible to arrange Chicago limo service, so there are numerous options for getting around the Windy City.